As I have been researching for building out this next phase of our garden, I have stumbled across a homesteading movement on social media. There are a bunch of different things that "homesteaders" do, but basically they try to be as sustainable and self-sufficient as possible. Growing their own foods. Making their own items. Often this includes chickens or other farm animals...but that's not really in the cards for us. Some of the things "homesteaders" do are things that I already know how to do...but maybe don't do them very often. For example, I'm great at making homemade breads and pastas and cooking from scratch. There's nothing like that yeasty smell of freshly baked bread. I used to know how to sew and knit. I could probably revive that knowledge with a bit of practice. The aspect of homesteading that really calls to me is relying on less. In wanting less, I'd like to rely on eating more from our garden...eventually extending the growing seasons. Some of the volumes of stuff people grow on lots the size of ours is pretty impressive! Also, another part of the homesteading movement that I want to aspire to is needing less and living more simply. 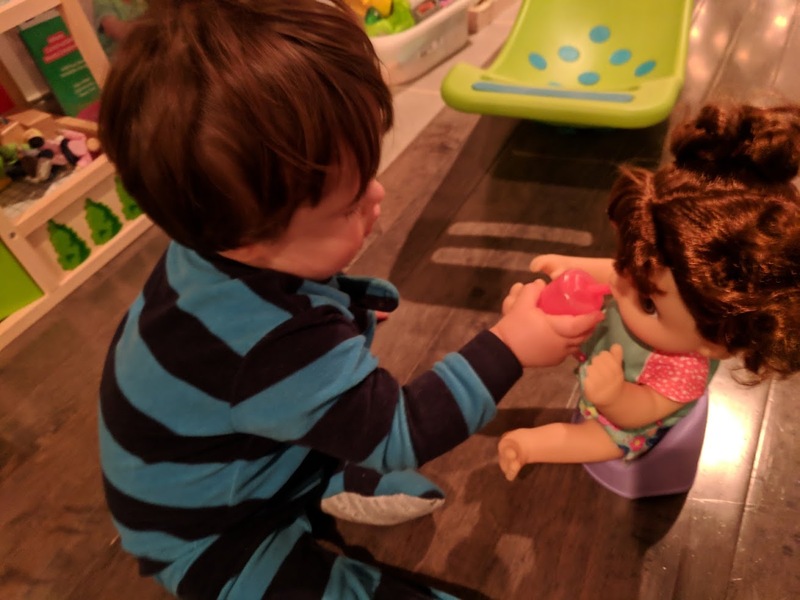 I want to try to not buy all the crazy toys for my kids so that they learn that they don't needs tons of stuff to be happy. The philosopher Epictetus once said: "Wealth consists not in having great possessions, but in having few wants." 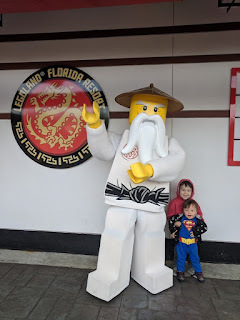 I want to raise my kids in a way that they have few wants not because they have tons of stuff, but because they realize that they don't need that stuff. I don't plan to quit my day job. 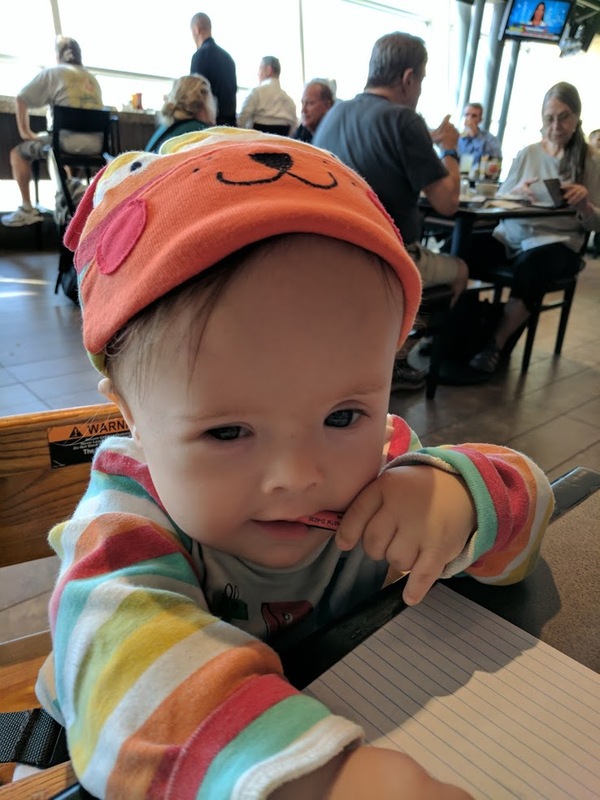 I just plan to save more and use that extra towards building a special needs trust for little Blueberry. And this also will reduce our carbon footprint which is also important to me. I have a tendency to want to do everything at once so I am trying to break down my goals to monthly projects. In addition to these monthly goals, my overall goal this year is to spend 15 minutes in the garden everyday. April - Create new beds (adding about 180 square feet). Plant seedlings. Start planting early season crops. Finish my project calendar for expected planting and harvesting dates. May - Lots more planting this month! Make a compost pile. June - Collect rain water to use in the garden. Month one of processed food detox. July - Learn how to can. Month two of processed food detox. August - Learn how to ferment food and make homemade soda. December - enjoy the holidays...trying to not go all crazy on buying all sorts of stuff we don't need. 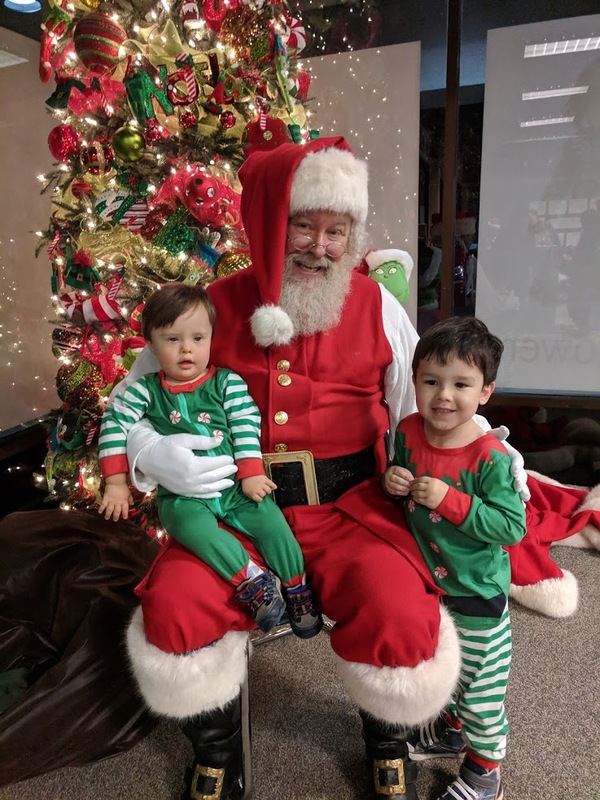 scaling down Christmas and focusing on what really matters...celebrating Jesus's birthday with those we love. 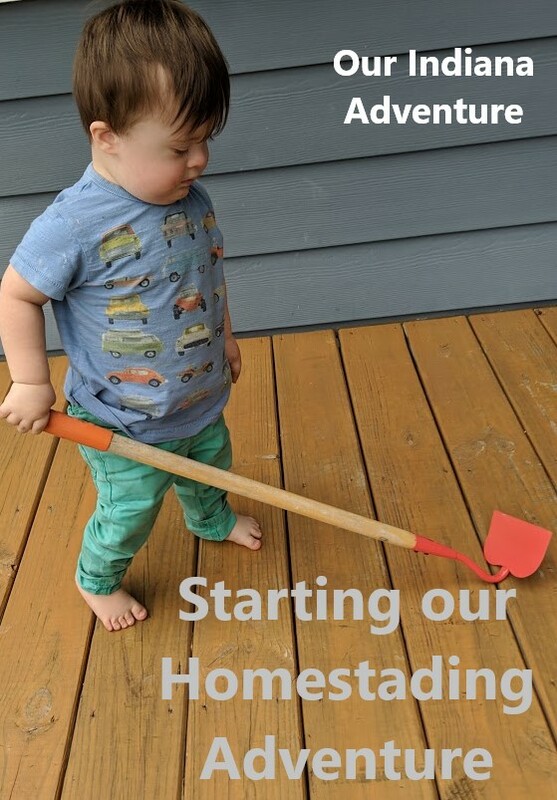 What homesteading or gardening goals do you have this year? I was hoping to get my first spinach, carrots, beets and chard in the garden today, but it SNOWed!!!! What?! That's Indiana for you. So, instead, I decided to plant some seedlings that I was actually a bit behind on. And I decided to try something new! I made little seedling pots out of newspapers! 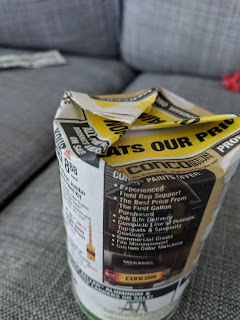 Apparently, most newspapers are printed with soy based ink these days so are fine for composting and in this case, using as fun little free planting pots. Masking tape is also compostable. I plan to just plant this whole thing in the garden and let the newspaper decompose. I'll probably open the bottom. 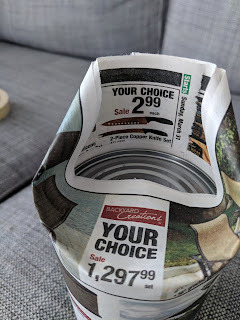 Also, as a side note...if you do this, make sure to put the whole newspaper under the ground, otherwise it'll just capillarity up the water to the top of the paper and let it evaporate. If you aren't sure, that's a bad thing. We want water in the ground, not evaporated. 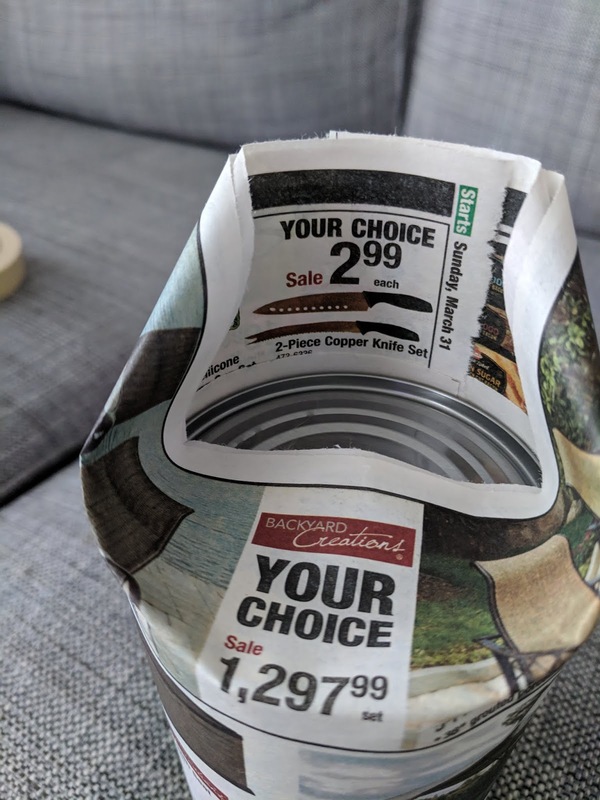 So, if you plant it with the newspaper pots, just burry the newspaper and you'll be fine. 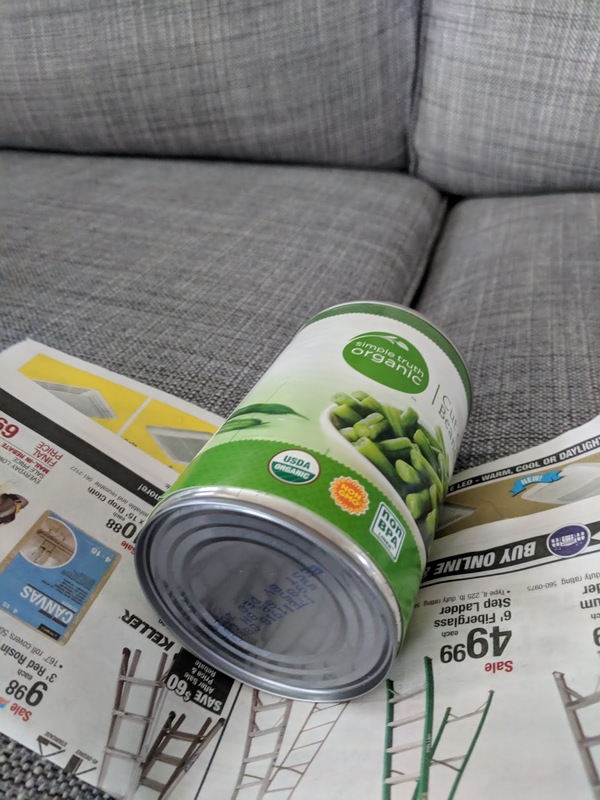 I took a piece of news paper, folded it in half, rolled it around the can such that enough was left on the bottom to fold under. I taped the side and then I folded it and taped it like I was wrapping a little Christmas present for myself. If there is a little gap, that's totally fine because that just means extra drainage. I used a can of green beans, but you can use any jar, cup, etc that is the size you want it. You can also make the pot any size tall. I went with about 5 to 6 inches. But if you are planting smaller things, you can make smaller pots. My litte Blueberry wanted to help make little pots! I made about 16 of them. Then it was time to plant! 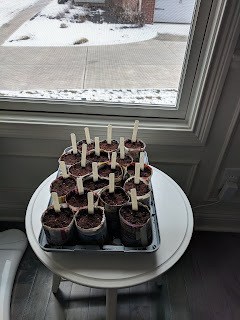 I used seed starting mix and got it wet until it reminded my little Tomato of Brownie batter. 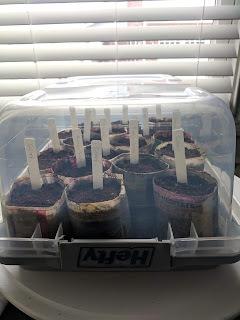 I had this neat Hefty deep rimmed box that is a perfect little greenhouse. I'm putting it on a sunny window sill to help with heat to germinate. As soon as my baby plants pop out, I have a grow light for them. 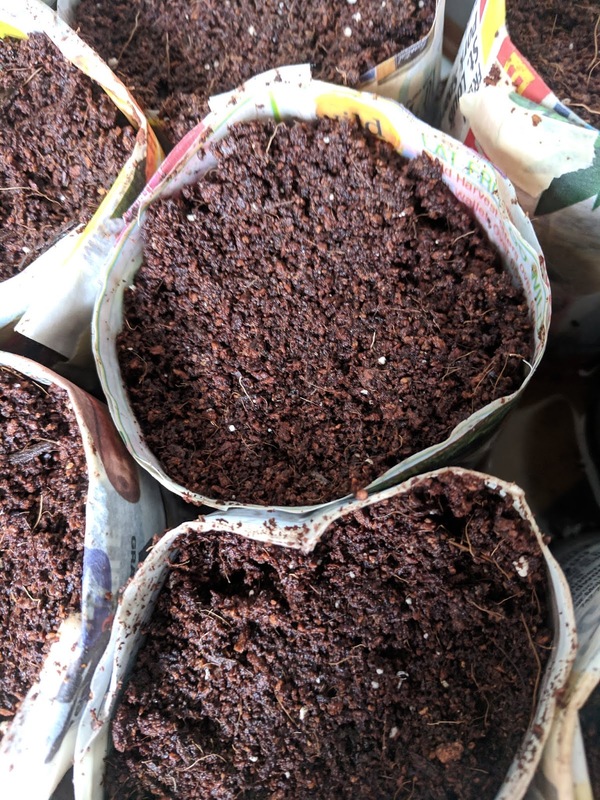 Super easy...and even better, I didn't have to waste money on those peat pots! I was a bit skeptical of the newspaper holding up to the moisture. I even had some draining water and they seem fine. I guess we'll see how they are in a few weeks! I will keep you updated. Has anyone else tried this fun little trick? March is International Disability Awareness month and I would be remiss if I didn't bring a bit of awareness to our littlest guy, who I have been referring to as Blueberry on this blog. To be honest, it's been hard to write this post calling him Blueberry. I keep putting in his real name. But hopefully I'm catching them all! Most people have 2 copies of each of their 23 chromosomes for a total of 46. 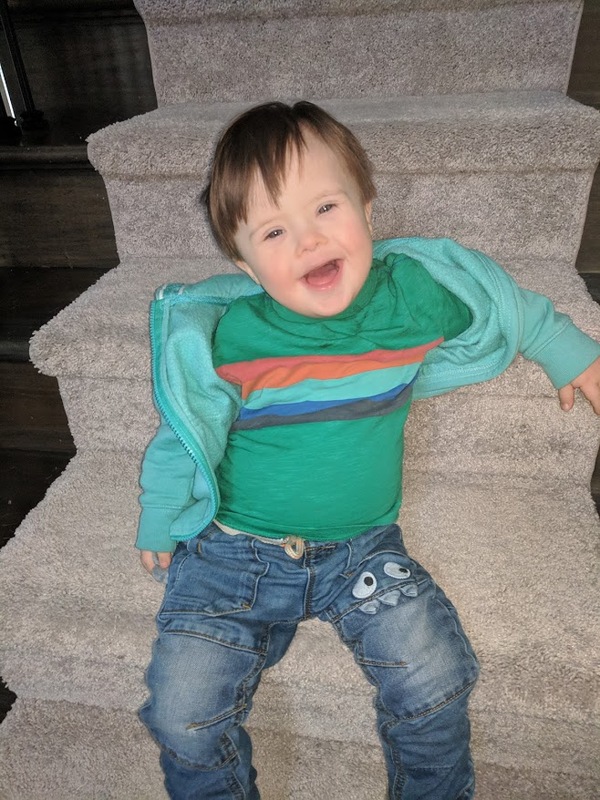 Our little guy has an extra copy of his 21st chromosome. 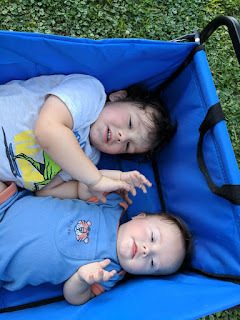 This is called Trisomy 21 or more commonly, Down syndrome. My little Blueberry is a little sweetheart. He has the BEST laugh. It's infectious and genuine. He gives the sweetest hugs, complete with a back pat! But he also is going through the terrible twos and the associated tantrums. 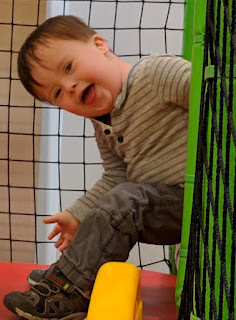 He can throw himself on the floor with the best of them (that "always happy" stereotype is not true... he has a very rich emotional life in the best and worst ways possible). He is master of the eye roll (adolescence hitting early, I guess). He loves animals, toy cars, camping, Batman and bowling. His favorite color is yellow and his favorite word is no. 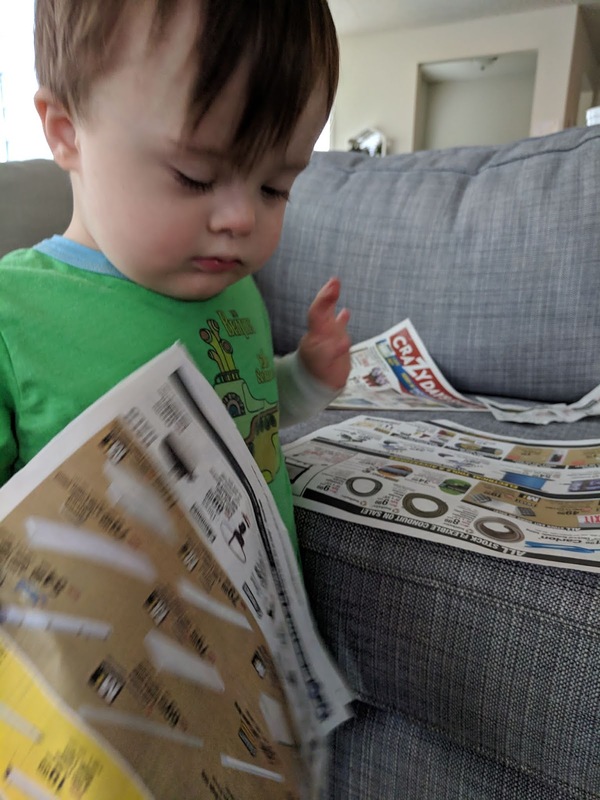 His favorite hobbies include putting stickers on my walls, sneaking tastes of his play-dough and coloring on his hands. He goes to a (typical) Mom's Day Out program once a week and loves to play with his friends and do all the crafts and songs. He especially loves the songs! Everyday when he comes home he wants me to get his craft out of the bag so he can point to it and loves it when I hang it on our fridge or wall. So saying that he's just like any other young child is very true. My little man loves food...he gets it from me. His favorites are: yogurt, graham crackers and any type of noodle. Doesn't matter the nationality. It can be USA Mac & Cheese, Italian Ravioli or Japanese Yakisoba. When he sees a morsel of food that he is delighted to eat, he gives an evil sounding little laugh and shoves it in his face. He has a curious and adventurous soul. 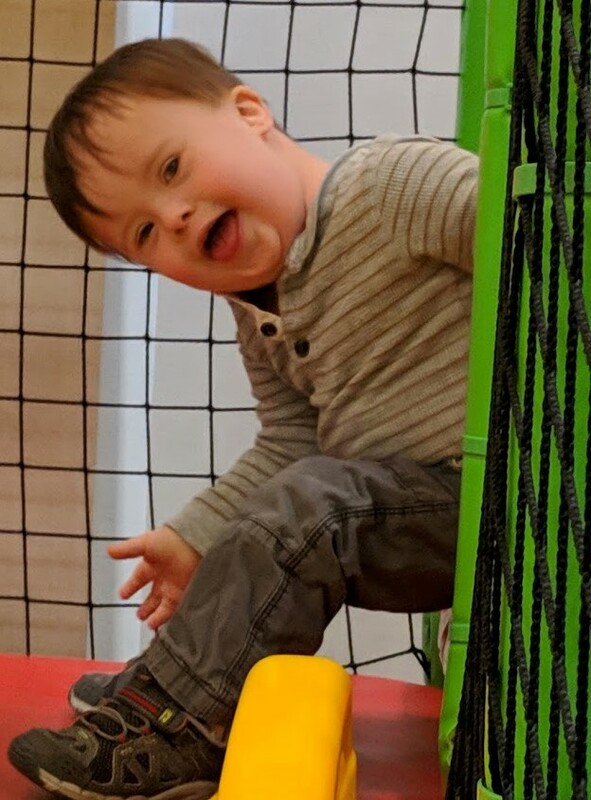 He is always excited to visit a new spot, to experience a new activity, and to meet new people. My Blueberry is super friendly. He gets disappointed when strangers at the store do not wave back at him. Our family loves to camp, hike, travel and visit new places. He is always up for anything. Though he is a bit passive in certain ways and really enjoys sitting back and watching all the people going about their activities. He's a people watcher. He gets that from me, too. 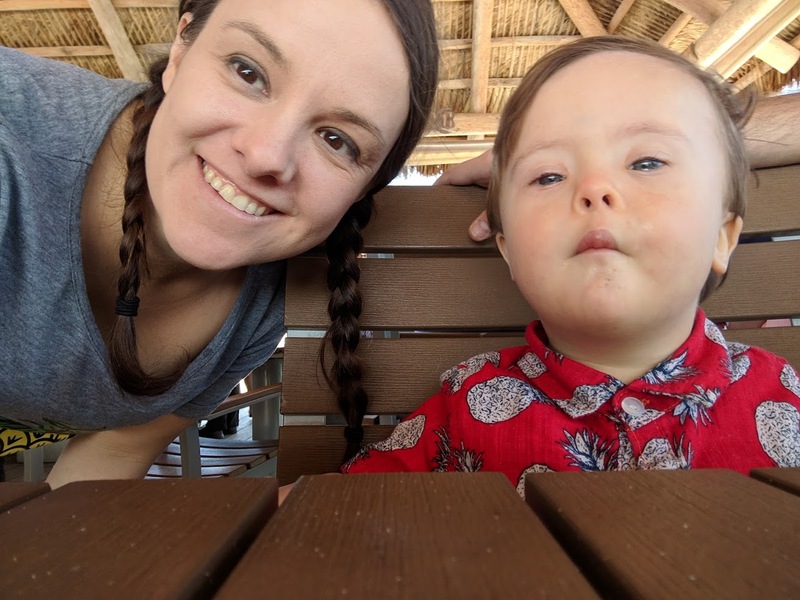 Of course, Down syndrome does come with challenges. 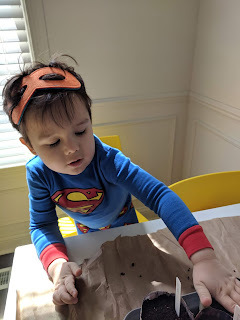 It takes my Blueberry longer to learn how to do certain tasks than it might take a "typical" child. 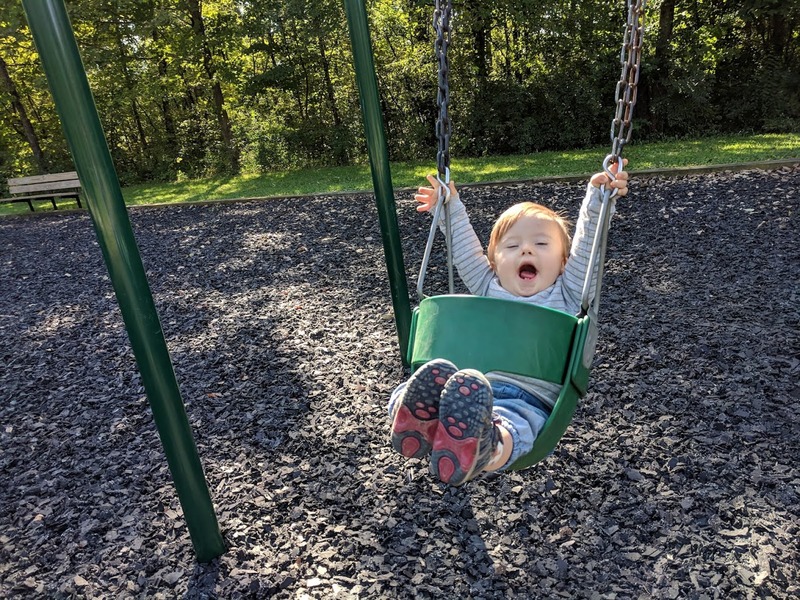 Each person with Down syndrome has different strengths and challenges. 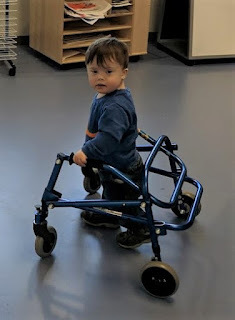 He walks with the aid of a pediatric walker...gross motor is his biggest challenge. But, there is a lot that he can do and he is learning new things every day. Blueberry really just wants to participate in whatever everyone else is doing. Sometimes this requires scaffolding. For example, since he walks with a walker, his hands aren't free to hold things. After dinner his brother is required to take his plate to the sink. So he wants to do this too. I hold him and he holds his plate. A child has never been so proud on a daily basis to help clean up the table. He just wants to be like everyone else because he is like everyone else. 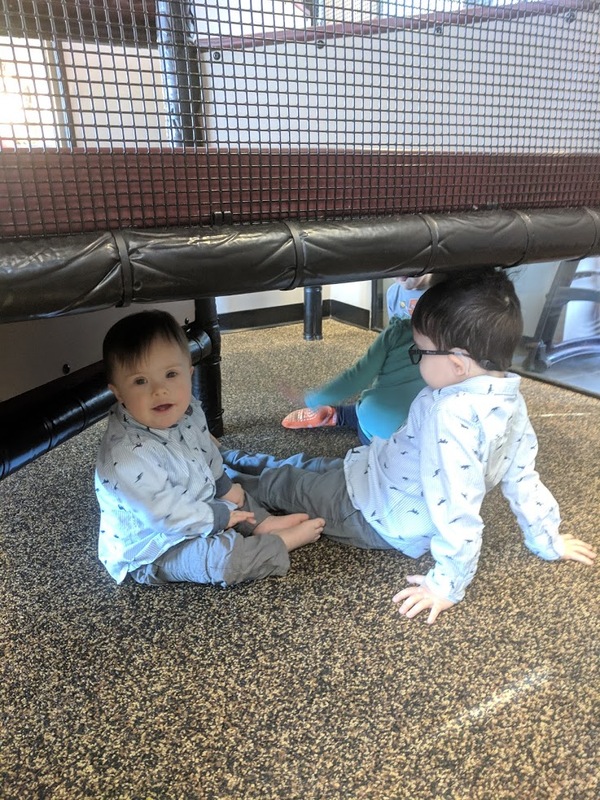 I believe that inclusion at a young age is why so many people with differences are excelling in society today and why it's so important to continue to figure out how we make sure every has the opportunity to participate in schools, clubs, activities and work. This is not only good for the individual but is good for everyone. 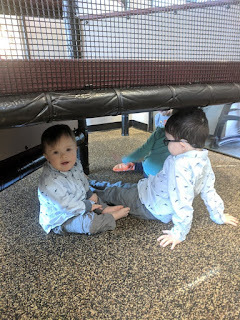 When Blueberry is included he teaches his typical peers about differences in abilities and how to be more accepting of all types of differences. Children learn from each other and helping their peers learn a skill, re-enforces and solidifies the information for the typical child. 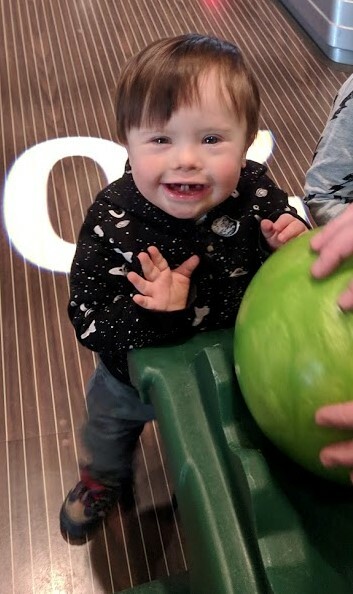 Whenever little Blueberry accomplishes something that is hard for him to do, a huge smile breaks across his face and his eyes beam with pride. He claps his hands and looks around to make sure we are clapping too...and will stare/glare at us until we do. He is inviting us to join him in his joy in that moment. And in this way, he is teaching me to appreciate and understand the happiness and pride that comes with accomplishments big and small. I think that Blueberry is a homesteader at heart. 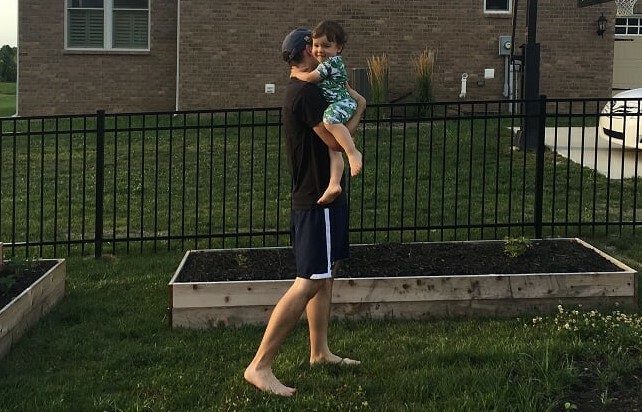 He always wants to try to do everything by/for himself, he loves to take care of animals and he wants to be outside all the time no matter what the weather is! My Blueberry is a silly, giggly, determined, inquisitive, spunky, driven, able, loving smile bucket and unique individual. He just wants what everyone wants: acceptance, love, the opportunity to reach his potential, and the ability to impact his community and his world in a positive and powerful way. He is living a great life...a life worth living. My Blueberry and all other people with different abilities or other differences are all created in the image of God the Father and are perfect in the way that He has designed. At the end of the day, the most important thing is for my children to know the saving grace of Jesus Christ and make it to Heaven. I know that I will help my boys and that they will help me. And that is really the only thing that matters in the eternal sense. As I said...we are tent campers, but the car tent camping style. 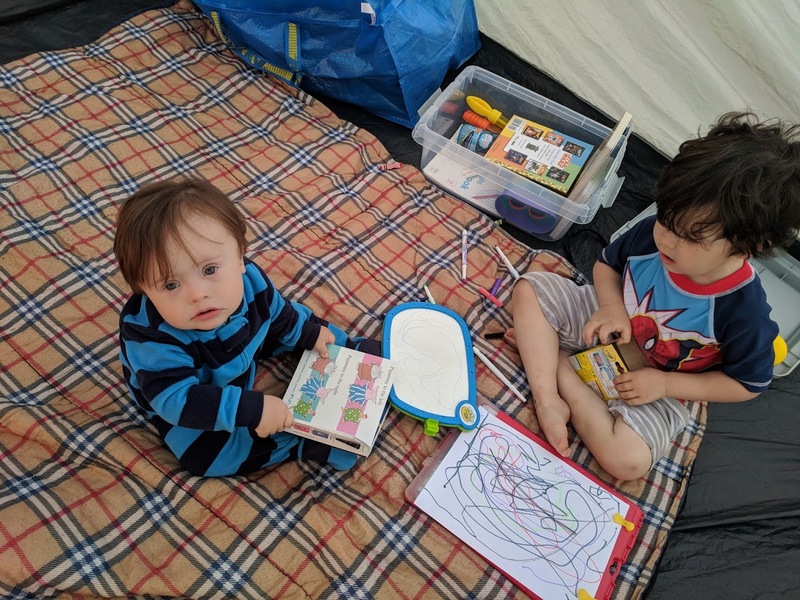 Some might call us "glampers" which means that we enjoy comfort while we camp. There are so many different ways to organize your camping supplies. 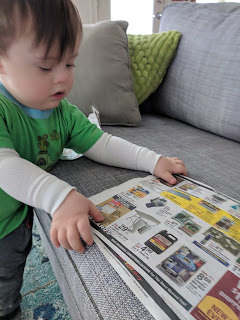 What has helped for us to have a few main categories and pack those items together. I don't have anything about the food here since I'll have it's own blog post. I use one of the orange utility bins, two stackable plastic bins and a few big blue IKEA bags for clothes and bedding. I love those IKEA bags. They are not expensive, super durable, have duffle handles, and backpack loops. I will say that we do not live in an area with actual bears. Just Yogi. But, if you have bears near by you will want to take extra precautions with anything that has food. 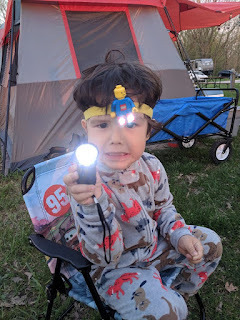 First I will share a few of my favorite camping things and tricks. Then I will inundate you with our official list. 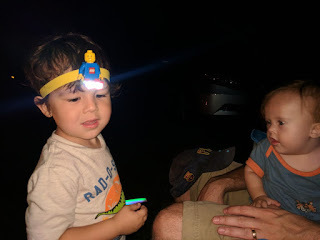 1) Head Lamps for Kids - Tomato has his own headlamp that he has to wear after dusk. It helps us keep an eye on where he is and also makes sure he sees where he is going. 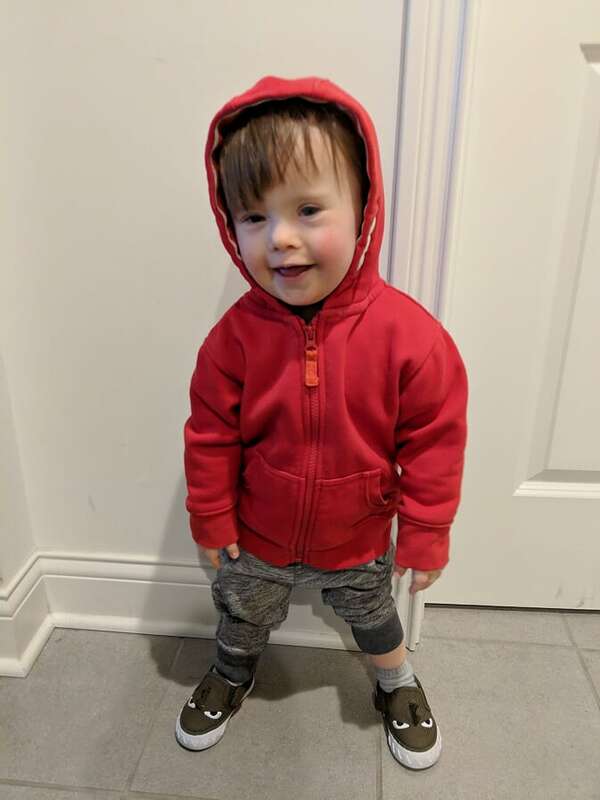 We also sometimes have him wear light up shoes which also help us track his movements. 2) Easy place for trash - Pop-up hamper, with clothes pins holding up a trash bag. This has been one of the BEST things we bring with us. 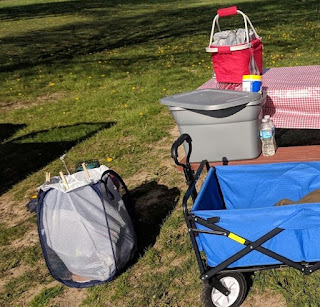 It's so easy to keep the campsite clean. I have a few extra bags in the bottom and you can kind of see the rock in there too to help hold the bag down. At night we move the bag into the car to keep the raccoons from messing with it. 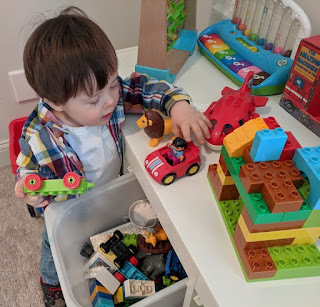 3) Stackable bins (also in the above picture) - The size of which depends on how much stuff you are putting in them, but I really like having them the same size so that they stack well and we look more consistent. 4) Garden wagon - great for hauling stuff around the camp grounds...or hauling kids. 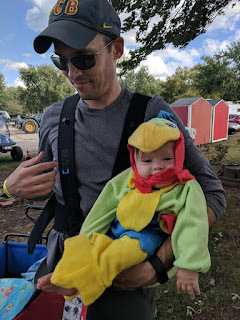 We bring this instead of a stroller. When Blueberry was big enough to go in this, but too small to not have some sort of padding, we brought the boppy and put it in front of him and a blanket behind. 5) Perfect for them camping chairs. Blueberry loves his portable highchair. We also use it for brunch at Gramma's and trips. 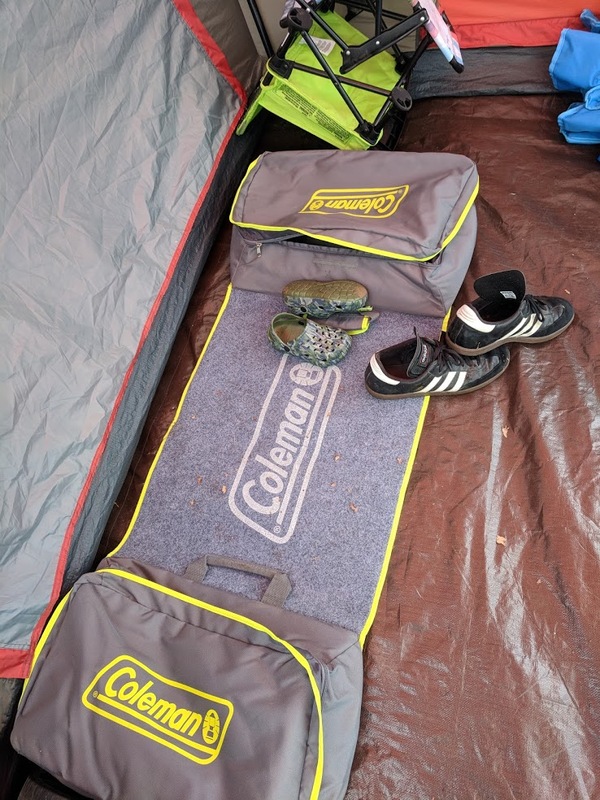 6) A footmat - My best buddy, Crystal, got this Coleman foot mat for me for my birthday a couple years ago. The shoes go inside the zipper areas so they they don't get all dewy at night but can still stay out of the tent. 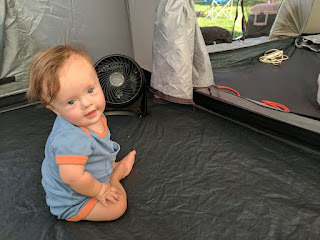 No shoes inside the tent. That's a hard and fast rule at our campsites. Alright, and here is the whole list! This bin holds the stuff that we need to get the tent set up. This is at a high level, anything we use to cook with. Each time it might vary depending on what food we are having that time. To help keep things a bit more together in this bin, I have a few smaller bags for First Aide, Lights, Batteries, etc...otherwise they are all a jumble inside this box. Or if I had them just in smaller bins, they got lost. So a bin of bags ended up being a good solution for my family. Right now they share a small bin, but I think as they get older they might want their own bags with their clothes and toys together so they can manage their own items. 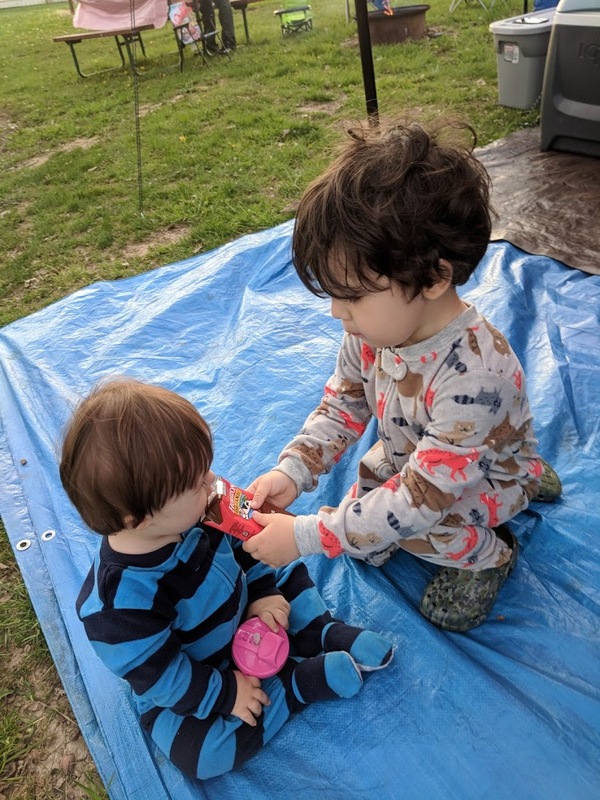 This sweet brotherly moment brought to you by camping! We are in the process of planning our new beds for all our new vegetables. "They" suggest that you plan these beds in the fall, but I like to live life on the edge. 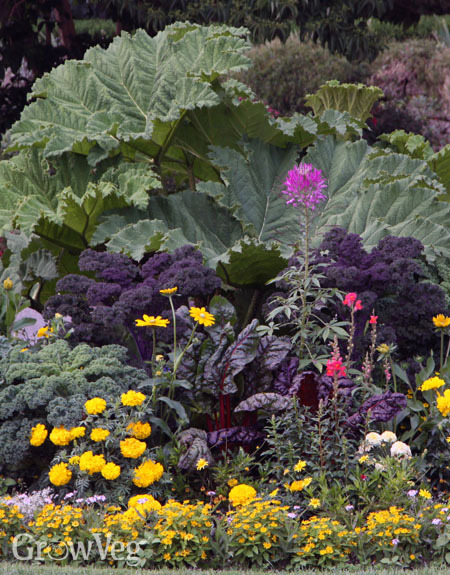 I really like Potager style gardens that combine edibles with beautiful flowers so the whole garden looks beautiful. The slightly more British take is the "Cottage Garden" another philosophy of making sure the place that you grow your veggies looks pretty. Though it is a bit less manicured looking that I'd like. My biggest source of garden envy is the Bayless Gardens in Chicago. I would not call myself the biggest tracker of Michelin stars, but back in my wilder days as a Chicago-ite, I did indulge a bit in such things. Rick Bayless has not only name recognition but also, he does a good job of presenting a down to earth image. He lives in a very trendy neighborhood of Chicago called Bucktown and owns three houses. He lives in one, rents out the other two and churns out veggies for his garden in the 3 city lots. 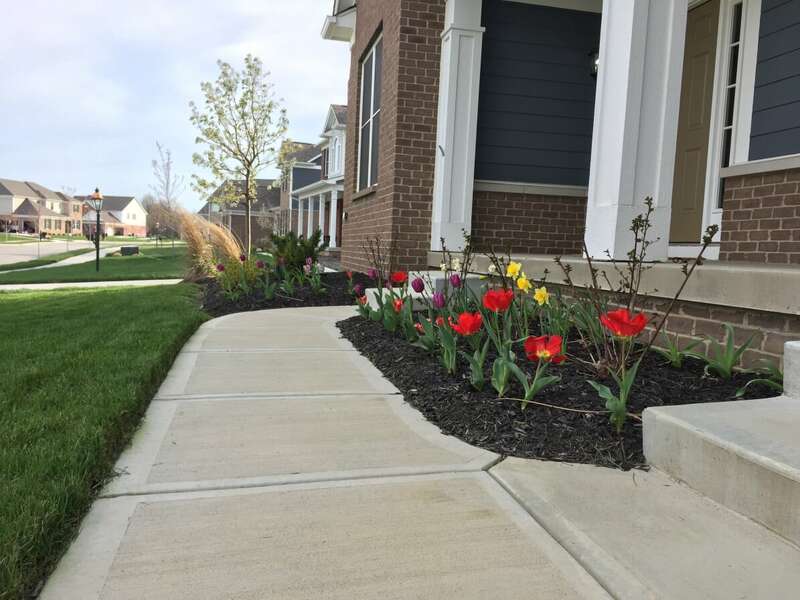 A standard Chicago lot is 25x125ft. But that includes the buildings. 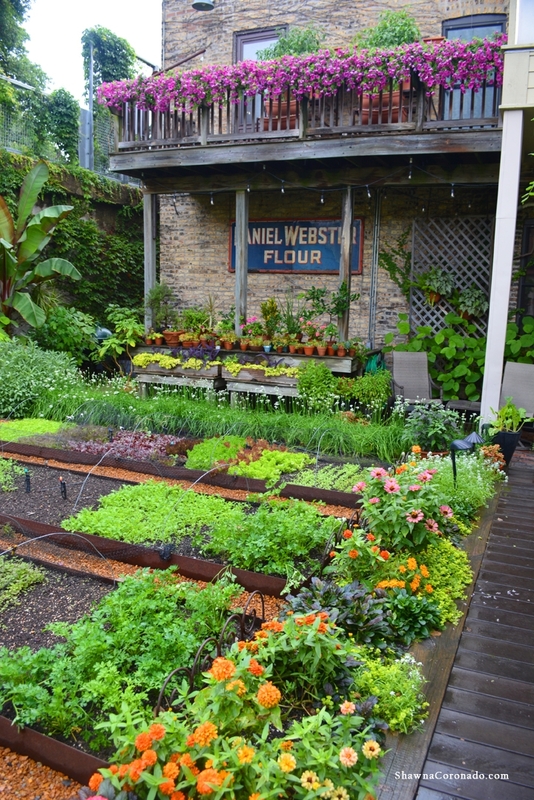 I've heard that the whole backyard area is only 1000 square feet, but he pumps out $200,000 worth of organic produce for his restaurants! Interestingly, he does not practice crop rotation. He just liberally adds compost and employs the use of beneficial flowers. He succession sows to keep greens coming for his restaurant. Okay HE doesn't succession sow personally so much. He employs a team of gardeners to help tend it since a garden this size is a full time job and he's got a restaurant empire to run! He also keeps chickens in his backyard, which is not as unusual as you might think in Chicago. I have several friends who have them. And he as a roof top garden at one of his other restaurants that make peppers, tomatoes and onions. 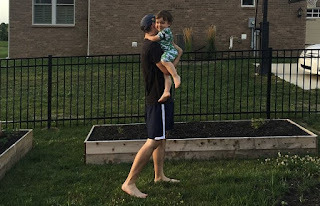 This blogger has a beautiful blog and garden! She actually has moved over to Olde Thyme Food Garden, which also has drool worthy pictures. I love her mixture of ornamentals along with the edibles. She's created a great environment for all the best bugs and animals and it looks amazing. 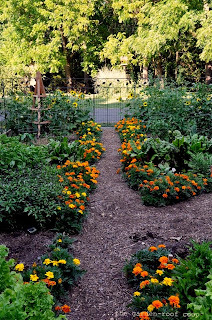 She has great advice for every season and so many different veggies and flowers. Otahuna Lodge is a beautiful Victorian mansion in New Zealand. They host events in their beautiful gardens and have multiple suites for guests to stay overnight. The potager garden grows many vegetables that the chef uses for the meals. Guests can even help pick their own vegetables for dinner! So cool! I have officially added this place to my wistful bucket list of places I'd love to go. I already wanted to see New Zealand, but this garden is just an even bigger carrot to go (pun intended). I like that this garden has an eating space in it. Although in this picture you can't see so many of his beautiful plants. I just really love the idea of a little eating nook nestled amongst the lush greenery. If you click here you can see some more pictures. I'm so impressed with all the produce he can create in his lot. He also has a great collection of good advice. 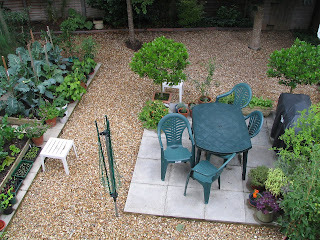 Here is another blogger who has a wonderfully amazing garden. The marigolds as edging are so pretty. And functional as they attract all the right kinds of bugs and discourage several bad ones. Plus the friendly bright colors are so inviting. 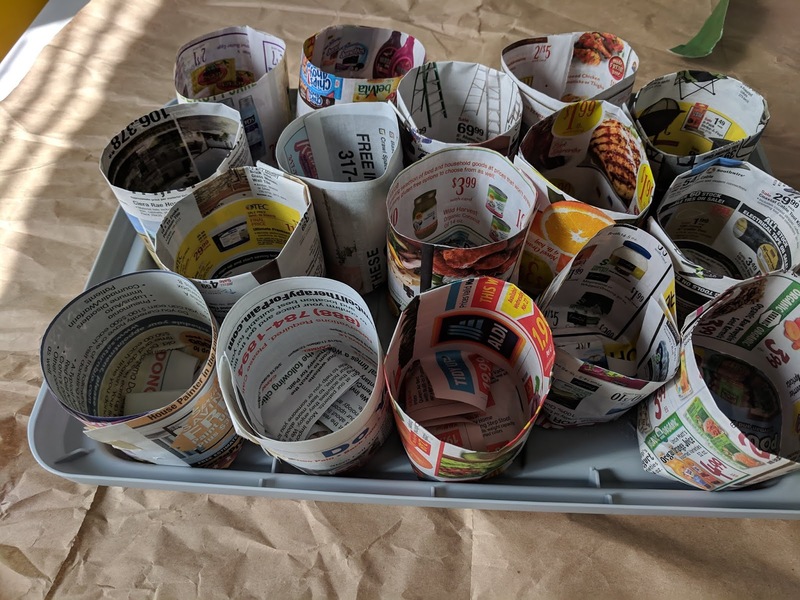 In addition to her kitchen garden, she also has some great resources on making a buttery garden! 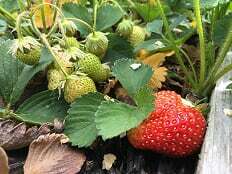 Grow Veg encourages planting edibles with ornamentals, but this particular post has some great ideas. This is actually a company that makes a garden planning software. Interesting concept. Maybe my first post about why I like to camp has inspired you, but you know nothing about camping. My goal with this post is to teach some of the basic concepts. My next post will give a detailed packing and organization list. Backpacking/wilderness - This was what I did as a young person. You get a special backpack, a light weight tent and take everything you need to camp with you. The longest I ever did was a 3 night 4 day trip. Car (tent) camping - This is what we do now. You load everything into your car, drive to the camp site, unload everything from your car and hang out there. 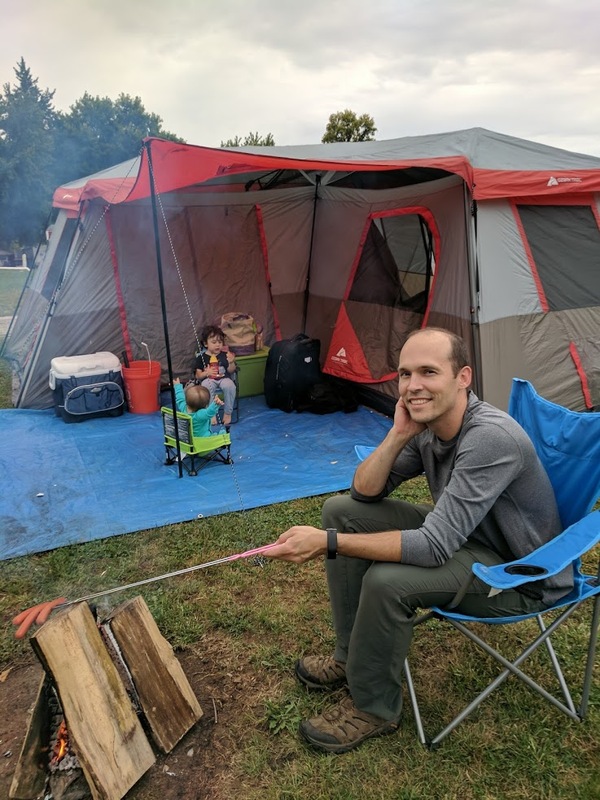 I love tent camping, but some tents don't handle the weather as well as other tents. My old backpacking tent did great in all weather, of course. However our huge family tent (that my brother-in-law dubbed "the Taj-ma-Tent") can't handle wind or heavy rain. After treating the fly (that goes over the top of the tent) with weather treating, it's fine in light rain, but we don't want to risk something stronger with the kids. RV/Trailer - Some people own RVs/Traiers and others may rent them at certain RV parks. I flirt with the idea of getting a trailer one day. Retrofitted bus etc - A guy I used to work with restored a VW bus and he and his family would go camping in it! Cabin - Some state parks have cabins that you can rent. You'll still need to supply almost everything including bedding, fire starting, etc. We plan on cabin camping a couple times this year at further away locations so that we don't have to set up our tent after driving 3+ hours and that we would want to make sure we still went even if the weather was bad. Glamping - This is just a term for adding some glamour and comfort to your camping trip. For example, with our air mattresses, we'd probably be called glampers! As you can see, D even has a fan to help keep him cool! 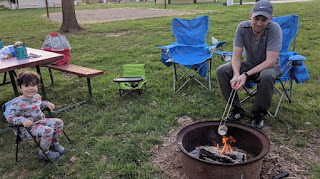 State or national parks- I enjoy camping at state parks. I've found them to be very pretty and less expensive than private parks, but they fill up pretty fast. In Indiana you can book 6 months in advance and you need to make sure you hop on exactly 6 months in advance especially for festival weekends. Even if you plan to do a backpacking/wilderness style trip, you'll still want to get reservations in advance. 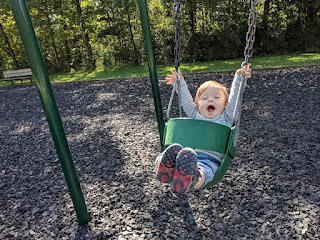 Jellystone parks- I love Jellystones! They all have a big Yogi bear that can come read the kids a story and pretend to try to steal their picnic baskets. Each weekend has a different theme and they usually have some sort of water play to do. We are usually the only tent campers in the whole place, lol, but that's fine! HOA- Another brand of RV parks. I have not personally camped at them, but Pete used to when he was a kid. Like Jellystones, they also have a lot of activities to do with your family. 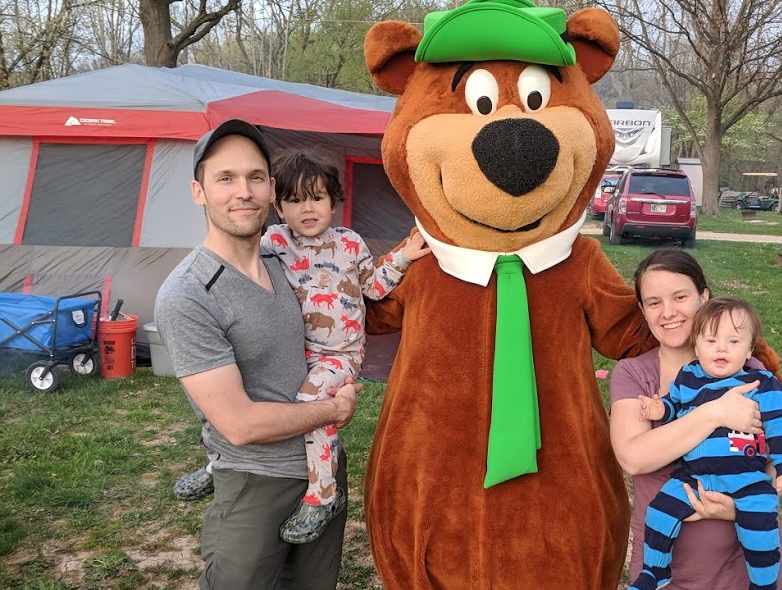 Private campgrounds - The quality ranges from place to place so really look at reviews before booking. Jellystones and HOA have standards to remain in the brand. Sometimes the parks are super great and sometimes they are more run down. We've had great experiences at the private campgrounds we've stayed at! This picture is from a Halloween festival at a local private camp ground! This is especially important if you are backpacking or going somewhere remote. If something happens to you or your family you'll want people to know where to start looking...or that looking is something they'd need to do. First Aid Kit - Accidents happen in nature and you'll want to be able to handle it. In my packing post I'll include what we have in our first aid kit. You'll also want to make sure to grab any prescriptions, of course! Bedding and something to put under it - You'll want a sleeping bag or something. But, I would not suggest laying it directly on the ground. Even when I did backpacking, I still had a sleeping mat. Albeit a self-inflating super light one. Now, as I mentioned above, we bring an air mattress. Z has a cot and D uses a pack and play. When it's cold, I put a blanket between the ground and our air mattress. The ground is a huge heat sink. I'd rather have a blanket under the air mattress to keep what I am sleeping on warm than an extra blanket on top of me. 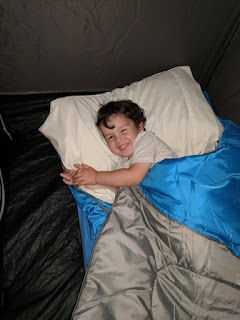 Usually we bring sheets for the air mattress and make it up like a bed but if the temperatures will get down into the 50's we each have our own sleeping bags. 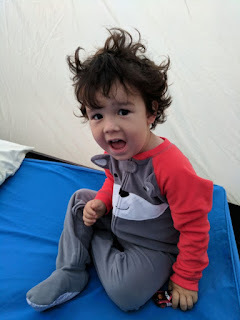 You can also get double sleeping bags, which we are planning on doing this year since the boys always end up in our bed in the early morning hours. A way to make fire - First, do not bring your firewood with you. This can transport insects and diseases to new areas. 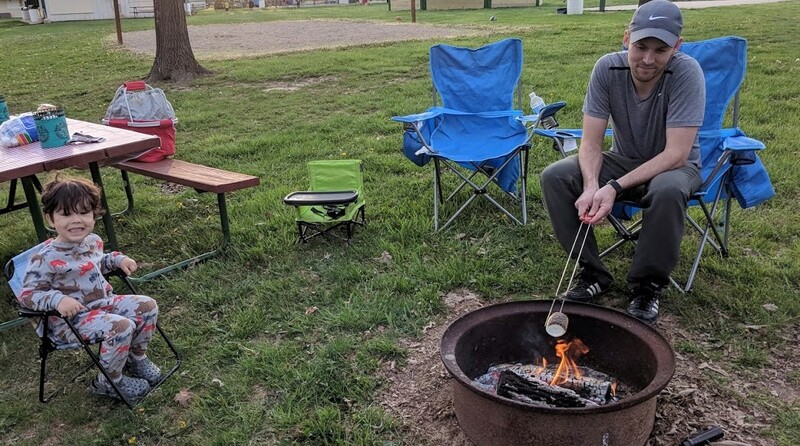 You should always buy your firewood where you are camping. But you will need matches or a fire starter and some kindling. Food - I'll have a whole post on camping food. This is one of the most important . But to start, you don't need to go all out. 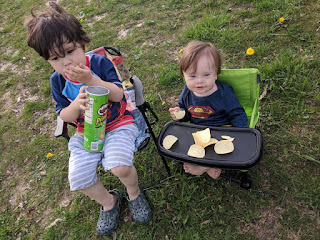 My kids are happy with hotdogs, Pringles and apples! Light - The best part of camping is when the sun goes down! But if you want to keep the fun going, you'll need some sort of light source. We have headlamps for the boys so that they can see and that we can see where they are. We also have lanterns for each adult and an extra one for the camp table...and a string of lights for over the tent door. We also have citronella candles to give us light and a bug free area. 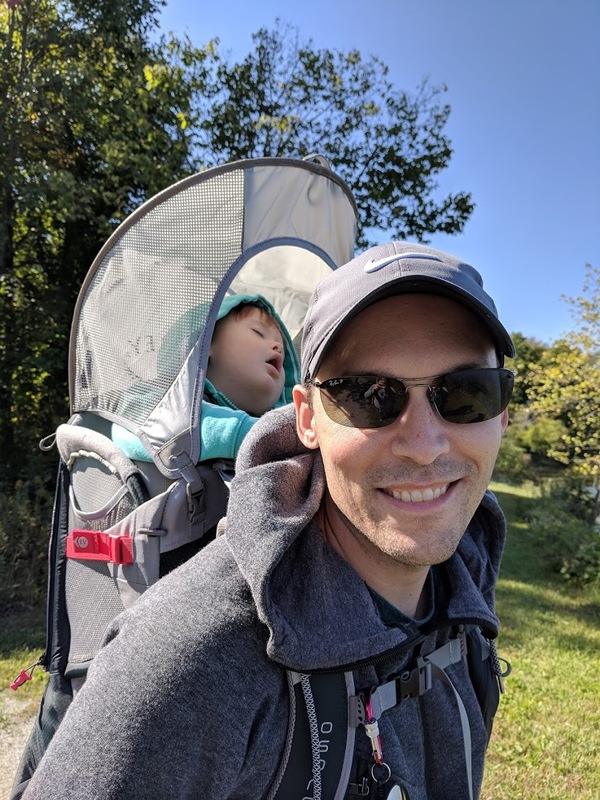 * REI - Intro to Camping - Lots of links with different reviews of gear. I love REI and we get most of our gear from either them or Cabella's. 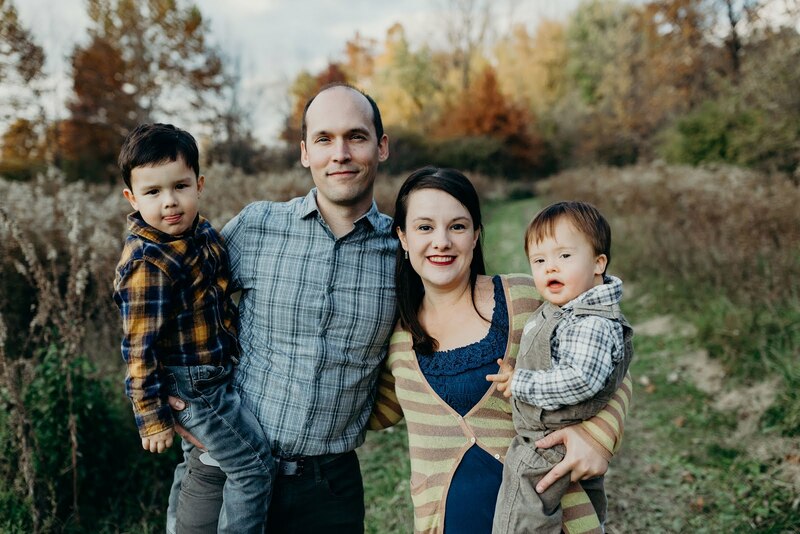 I'm Lauren...an Indiana girl raising my kids and my veggies! Thanks for popping by and reading about our adventures.